Now three years on, the team of students has made it to the state championship in Oxford Feb 22 & 23. Organizers are seeking community help getting the team of 15 to North Mississippi — primarily for food, gas, registration and vehicle rental, up to $1,600 total. 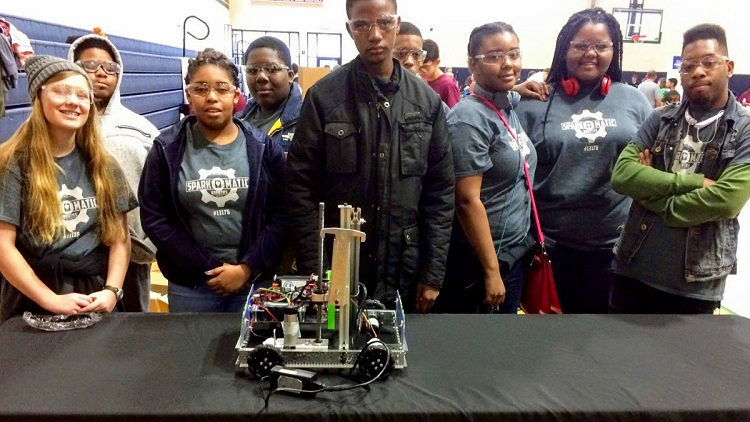 If you donate to our GoFundMe page and include the hashtag “#BNARobots” in your message, Broadmeadow Neighborhood Association will match your donation up to a grand total of $350. Any money raised in excess of the goal for the trip will be put back into the program. Spark-O-Matic now has a new practice and meeting space at Broadmeadow UMC, and soon plans to offer programming to Broadmeadow neighborhood students in grades 6-12.